[From the Telegraph] Darjeeling, Sept. 12: Krishna Bahadur Mukhia, who once drove Netaji Subhas Chandra Bose’s car during his INA days, died in Darjeeling on the night of September 11. One of the last freedom fighters in the hills, Krishna Bahahur was 91. He died in his residence in Rockville Dham and is survived by three sons and two daughters. 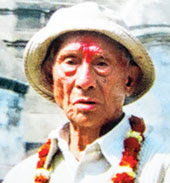 Krishna Bahadur was born on May 12, 1921, at Glenburn Tea Estate. 1942, he was taken a prisoner of war by the invading Japanese forces and sentenced to jail in Japan. When Subash Chandra Bose founded the Indian National Army, Krishna Bahadur was released by the Japanese and he joined Bose’s struggle for Indian Independence. In 1943-44, he was Netaji’s driver, the job given to him perhaps because he was a mechanic. “In 1944, while fighting against the British, my father was again captured near the Indo-Burma border and taken to Delhi. Even though he was released, he was not given post-retirement benefits by the British,” Suresh said. After his return to his native place, he worked as a driver in various tea gardens and was later appointed as a driver by the District School Board. “He retired in 1986,” Suresh said. On August 15, 1972, the Indian government conferred on him a tamra patra (a copper plate) for his involvement in the freedom struggle. This year on Independence Day, Krishna Bahadur was invited as a special guest and the Gorkha Janmukti Morcha handed him a token amount of Rs 1 lakh. The funeral will be held on Friday.